The central bank has sucked renminbi out of Hong Kong, sending overnight interest rates soaring. The show of force helps stabilise the short-term exchange rate. But it delays the gradual shift to a less controlled currency, and will force officials to tighten capital controls. China’s central bank held the line on its yuan for a fourth straight session on Jan. 13 while squeezing offshore sellers of the currency, dampening fears of a sustained depreciation. The People’s Bank of China (PBOC) set the mid-point for the yuan at 6.5630 to the dollar, virtually unchanged from fixes on the previous two days. The overnight Hong Kong Inter-bank Offered Rate denominated in yuan was fixed at 8.31 percent on Jan. 13, down from 66.8 percent the previous day. 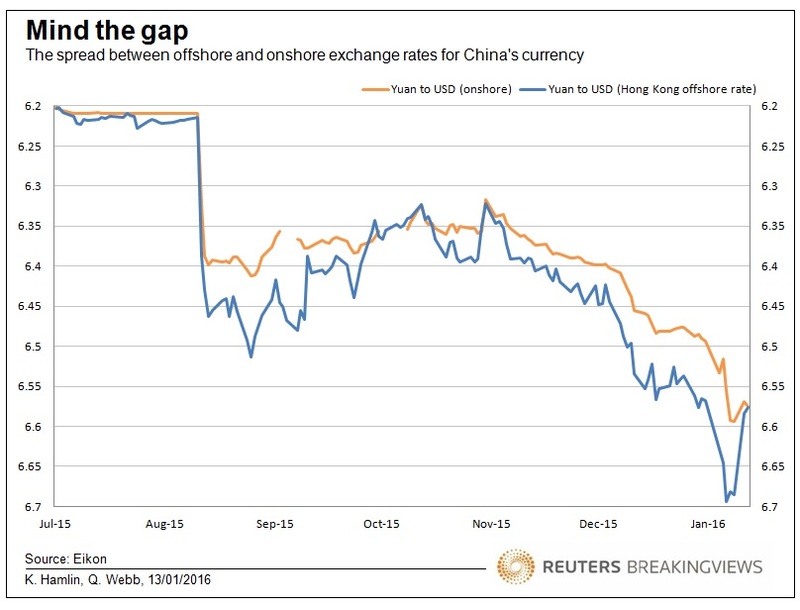 The squeeze has dragged the offshore level of the yuan back toward the official level, closing a gap that had threatened to get out of control just a few days earlier. Domestic equity markets reacted with modest gains. The Shanghai Composite Index added 0.2 percent and the CSI300 index 0.1 percent.